Looking back on this thread I can hardly believe the amount of information that has been generated. Who would have thought that the original query could have escalated into this! I wonder if my family at number 23 was even remotely aware of the history of the place. I doubt it as my mother tells me that she was totally unaware that they ever lived here, although they spent at least 16 years at the address. But then they didn't seem tot talk much about the past in her family. Read on for a few pages....it describes life conditions and the types of businesses that once existed in and around the Square quite colourfully. There is also a bit of information on the Molendinar Burn which apparently lay near the square. 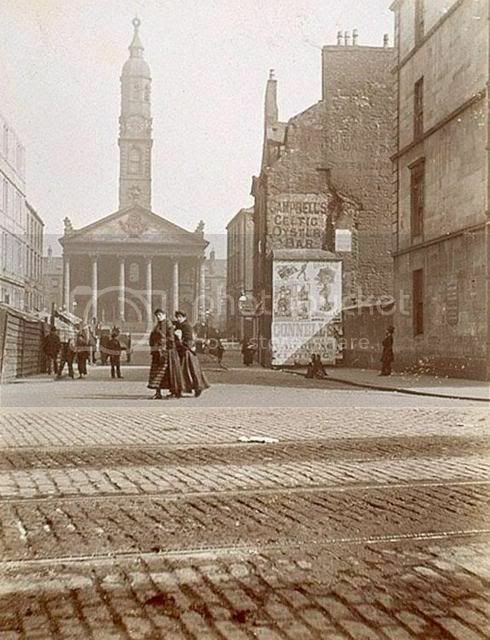 When construction of the new church by the town magistrates begun, the area around what would be St Andrews Sq had a completely open aspect to it, being separated from the bustle of the Saltmarket wynds and closes by the Molendinar which flowed freely to the east and down to empty in the Clyde with fields stretching all round from the Gallowgate to the Green, hence the comparison, both in terms of architecture and setting, with Gibbs St Martin in the Fields. 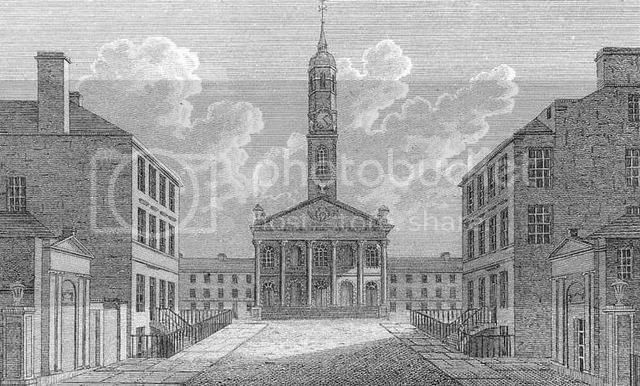 Begun, as mentioned, in 1739, St Andrews in the Fields was to be the first church built in Glasgow since the Reformation of 1560, but work stalled on the church and it wasn’t completed until 1756. In that time, the ‘New Church’ was usurped and its title snatched by the Episcopalian upstart just a little down the street, namely St Andrews by the Green, which was completed in 1750 with a construction time of little more than a year. So why did building of the church take so long? Well, its worth remembering Bonnie Prince Charlie’s expensive week-long visit to Glasgow in 1745/6 when its reputed that he actually stabled his horses in the unfinished church. The town had to pay BPC £5,000 and clothe his army on top of the £26,000 the church was costing (even then these projects went way over budget) and then there was the general air of upheaval and uncertainty which must have been the major contributing factor to the loss of confidence in the building project. Never the less, the church was completed and patronised by the wealthy elite of the town – that is to say the ones who could afford to pay for a pew. Part of the reason St Andrews was built where it was, in the middle of fields, was for the increasingly wealthy traders and merchants of Glasgow to escape the great unwashed who congregated in the High Kirk/Cathedral, where you didn’t pay for your pew. It’s hard to imagine having to pay to go to church these days, its also hard to imagine what the church would have looked like rising from its splendid isolation in a style never seen before in Glasgow on such scale. Anyway, it was another 30 or so years before the square around the church started to be developed with mansions for the wealthy elite (meanwhile Lunardi had made a fortune from his balloon trips as HH has shown) and roughly contemporary with the building of David Dale’s mansion in what would become the gated mansion community of Charlotte St. And it was David Dale who brought the first branch of the Royal Bank to Glasgow which took up home in a mansion in St Andrews Sq. The branch soon became one of the busiest bank offices anywhere in the UK and was guarded by sentries in the square outside. Gradually industry and manufacturing in the area had increased to the extent that the wealthy moved west, away from the prevailing wind and its cargo of grime and the square and area around it became a lot more densely populated with tenements replacing the once proud mansions. Gradually the street pattern we see today began to form and the once proud new church’s grandeur faded as the wealthy congregation it once had defected to St Georges Tron church. You can see this process nicely illustrated by the maps HH has posted, also worth noting on HH’s maps is the Molendinar which snakes from the north, kinking east and down to meet the Camlachie burn on the Green. The decline, exacerbated by the coming of the railways to the area, continued right up into the latter part of the 20th century with the original tenements being demolished in the early 1980’s. When GBPT undertook the restoration of the church in 1994 it was decided that any development of the square would have to echo its past Georgian grandeur and follow the lines of William Hamiltons layout. And so with much discussion between GCC, GBPT and the developer a scheme was developed to echo the lines and massing of the church and the handsome, if a little stubby, modern tenements were erected. Its poetic almost, in that the building of the church acted as the catalyst for the development of this area east of the Saltmarket and south of the Gallowgate back on the latter half of the 18th century and two centuries later the church again became the catalyst, corner-stone even, of the redevelopment (and re-gentrification) of the area. I’m afraid I can’t help you with your initial inquiry Nina but I’m sure we’ll get to the bottom of it sooner or later. The only thing I can add to the discussion regarding the disappearance of no 23 is that the old numbering system was completely discarded with the loss of the original fabric and vennels of the square with the modern system of numbering implemented i.e. one number for the close door, the other for the back door… not that that wasn’t probably glaringly obvious already. If anyone wants a tour of the church I’m sure I could arrange it, depending on numbers. Excellent piece,Crusty, and one worth waiting for at that I was about to re-post the sketch with the Molly running past but you have already alluded to it. Good to have the demolition date pinned too. I note your use of the word 'Vennel' where I have used 'Pend' What is the difference between the two? It never occurred to me about the numbering system, are you saying that separate families lived in the rear half of the building & therefor on a different street? If so, what was the name of the street / lane? I'd forgotten about the tale of Charlie's horses being stabled in the church. When you describe the present buildings as being 'stubby' I take it you mean that they have lost at least a floor & possibly two? 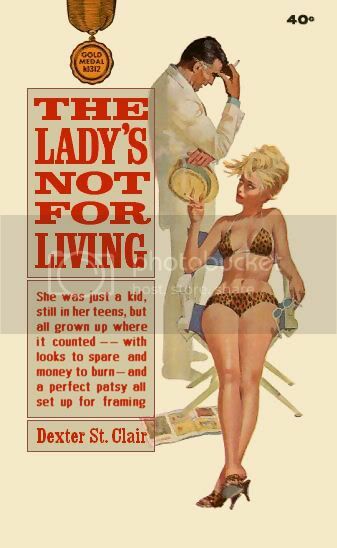 * Oh aye, meant to say, before Mr. Dexter interjects, Mr. Dale is, of course, not a Glaswegian born & bred. Last edited by HollowHorn on Sun Oct 14, 2007 8:51 pm, edited 1 time in total. Mr Dale as in New Lanark Mr Dale? I have a book in here about there, I'll have a look and see if it has any more bits for Mr H's thread. As for me referring to the new build as stubby, I'm talking purely aesthetically. The square has been very well balanced overall by the new build, which has actually increased a floor (or more in places) in height but modern ceiling heights just don't allow for the elegant Georgian proportions of floors and windows and so in that respect its a little stubby but still a nice response to the setting and history. Thanks for the extra info crusty...it was worth the wait The original query seems unimportant now after so much else has been discovered about the Square. Thanks for the latest pics hollowhorn...what a difference a century made! I like the wee peek I get at the buildings behind the church as they are probably where my family lived. Vennels must have had accesible entrances for buildings too, since I have found a few addresses like "New Vennel" and Old Vennel". Now what was/is a Wynd? Given the origins of the English language with roots in Latin, French, Viking etc it's not surprising that we have different words for similar things. crusty_bint wrote: A pend is a covered passageway leading to a courtyard or space behind a building (like in St Andrews Sq), a vennel is really a lane/minor street between two gable ends. A wynd, I suppose, is the stage between street and vennel, being a lane or alley or minor street that is an offshoot of a main street. You are not serious !! Dexter. REALLY , We have different words to describe the same things ? Who would ever have thought it.